If you are an office going person, it can get very difficult to find the time to go to a gym and if you are on a strict budget then the very concept of spending large sums on monthly gym membership can be pretty bothersome. Gratefully, with the introduction of treadmill desks you can now exercise while working and maintain your fitness with a minimum one-time expense. 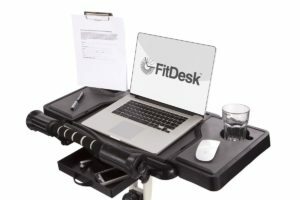 FitDesk is one of the premium treadmill desk in the market and its version 2.0 has already hit home, with fantastic new upgrades and a sound appreciation from a majority of the customers. The FitDesk v2.0 is a light weight exercising desk. It focuses on improving your cardio, while keeping you focused on your work at hand. Be it writing an article, watching stocks, playing games or reading files – you can do them all and more, while toning your body. 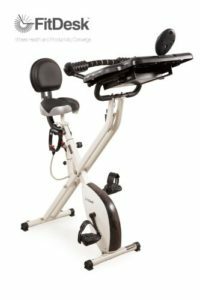 It is a great piece of equipment to have for avoiding the typical sedentary lifestyle. As you know, being sedentary has been proven to be significantly unhealthy to the human body and a precursor for several diseases. The bike has a very small footprint, being only 28 inches long and 16 inches wide. It can easily be folded after use for storage or transportation. The adjustable back rest allows added comfort and usability for longer periods of time. There are massage rollers installed for support and relaxation of the arm and wrists. Eight level of resistances ensure that there is a challenging exercise mode for people of different fitness levels. You can mix up the resistances for a variation in your exercise routine. You can even attach resistance bands for a focus on your upper body as well. LCD monitor tracks the vitals, including heart rate and distance travelled. Solid steel frame and high quality parts ensure that the bike is super durable. 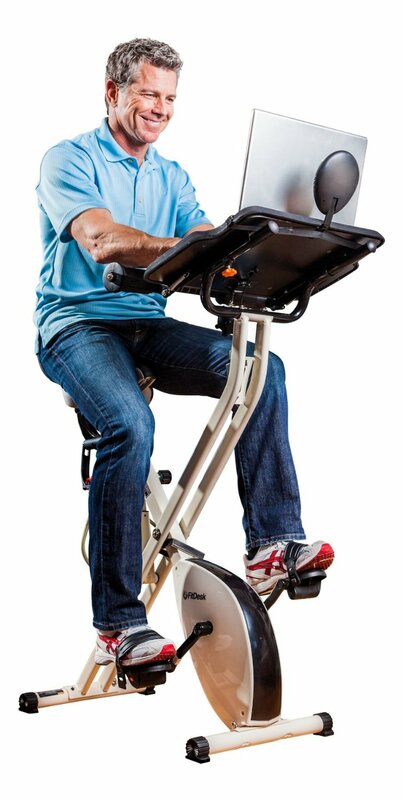 The FitDesk v2.0 has been designed to be used for long stretches of time, without any discomfort or distractions. This is what sets it apart from other ordinary fitness bikes. If you are unable to squeeze in your workstation on the original FitDesk Desk, you can upgrade to the Extension Kit. This kit willincrease the space available by two times. It also comes with a mouse pad and a cup-holder for added functionality. 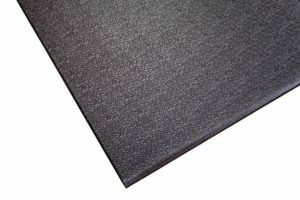 A Supermat is a heavy duty PVC mat that will protect your floor from wear and tear of the fitness bike. The mat absorbs the vibrations and pressures created from using the FitDesk and will dampen any noise generated from metal touching the floor. It is strongly recommended if you are living in a rented space or have hard floors. The best sitting ergonomics have you sitting up with elbows resting on arm rests bent at a 90 degree angle. Your arms should be stationary as you type (See this keyboard) and you should use a mouse that does not require movement in your wrist or arm (like this). Further, when using an exercise desk, you do not want to have to push down with your wrists to stabilize your hands at all! Pushing down to achieve stability will cause stress on your elbows and shoulders that eventually leads to surgery after years of use. Be sure to use good ergonomics while you use the FitDesk 2.0.